Regular machine maintenance can prevent costly downtimes at your production. We provide the support you need and are offering special Service Packages exclusively to our best customers. From single machines to full service packages tailored made to suit your individual requirements. Contact your Meri representative and find out more. Arrange an appointment for top service and maintenance for Meri equipment. We offer a coordinated service package, consisting of regular checks of the performance and condition of your machine (or machines). At the same time, we make sure that the necessary spare and wear parts are readily available and that they be changed at regular intervals. We responsibly organize preventive maintenance as well as wear and spare part logistics for your equipment. This can be managed either by our own personnel or the customer’s assigned plant personnel. 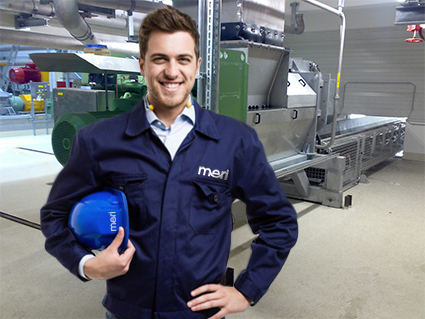 The responsibility for maintenance and spare parts lies completely with Meri. Within the scope of a full service contract we take care of maintenance, servicing and spare part repairs for designated machines for 36 months at a fixed price, within the framework of the machine’s performance data – for example throughput figures.